The Forever Solar Power Bank is a 8000mAh portable battery with solar charging and is the perfect companion to ensure your smartphone has enough charge. Features a waterproof design and dual USB ports for universal compatibility. With an impressive 8000mAh available battery capacity, you can ensure your smartphone survives the day and beyond. Surf the web, check your email, send a text message and make a phone call in the secure knowledge that if your phone battery is low, you can fully charge your smartphone with power remaining with the additional power your trusty Solar Power Bank provides. Apps that require more juice to operate including graphically intensive games or those that use GPS are no longer an issue, so play and navigate for longer with the Solar Power Bank. Compact and light, the Solar Power Bank is always ready for your next adventure - letting you charge wherever, whenever. Using the abundant power of our greatest resource, the sun - you can recharge outdoors without the need for mains power thanks to the integrated high efficiency dual solar panels. You can also recharge the power bank using the built-in USB charging cable. With existing USB charging cables, you can simply plug into the built-in USB ports on the Solar Power Bank to benefit from the 8000mAh of additional battery capacity it provides. This means that you can still use your existing USB charging cables to provide the extra juice your devices require. With two USB ports, you can charge two devices at the same time. Never be left wondering whether you should charge your personal or work smartphone, instead charge them both at the same time. 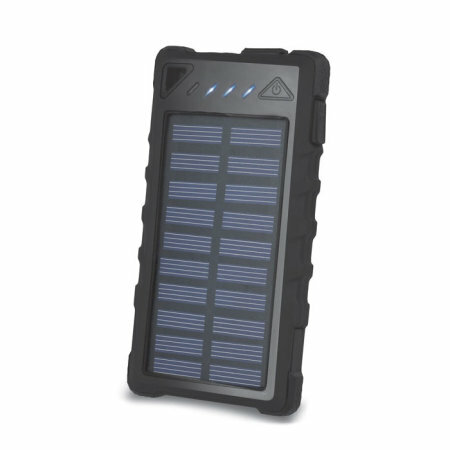 The Solar Power Bank provides you with the freedom to charge your devices anywhere. Connect your smartphone and instantly charge your device. This is perfect if you're on the move or don't have access to a mains power source to charge your device, including camping holidays and music festivals. Designed to be portable, the Solar Power Bank is small in size so it fits in a bag, pocket or case easily and boasts a clean and simple aesthetic. The power bank has a feature that allows you to use the power bank as a flashlight, perfect for those of you that want to use your power bank at night. Additionally this power incorporates a built-in SOS light function, ideal for emergency situations. 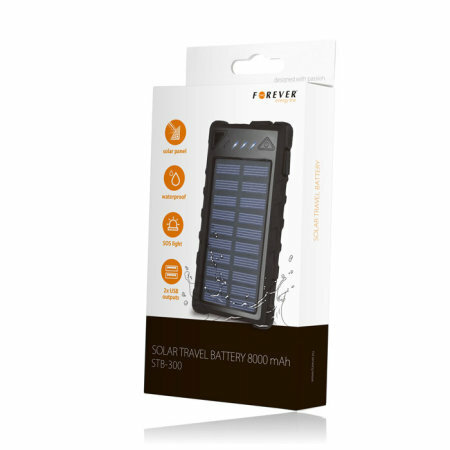 This portable solar battery is also waterproof, meaning that you can use it any weather conditions and you know that your device will be protected.